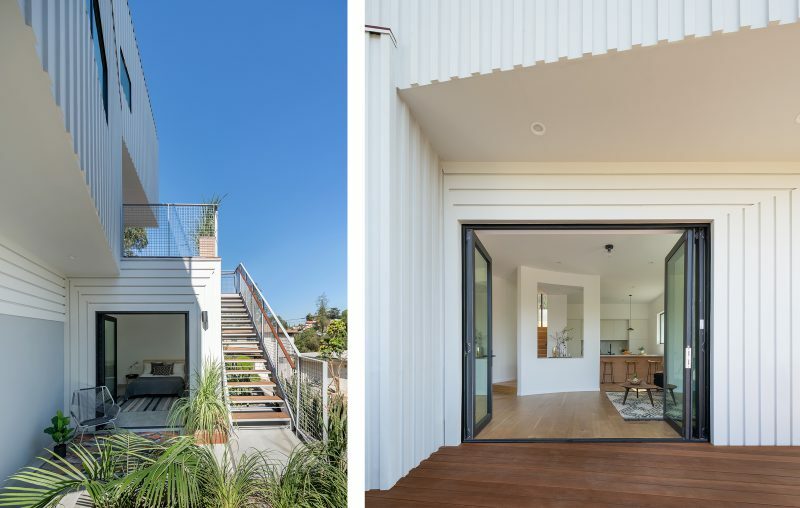 Stack House is a newly built 2,207-square-foot residence designed and developed by FreelandBuck. 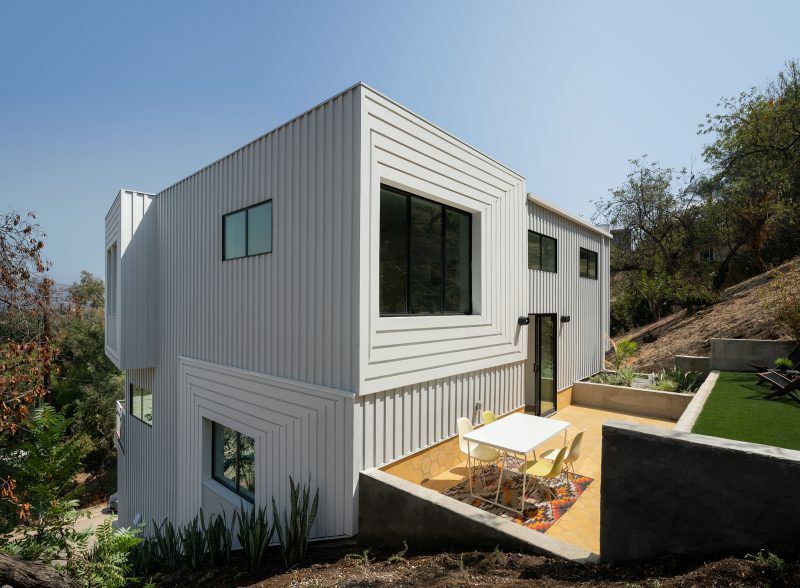 Comprised of four stories notched into a sloping hillside, this vertical house uses the subtle rotation of each room to create seamless indoor-outdoor spaces at every floor, each with unique and unobstructed views to the San Gabriel mountains. 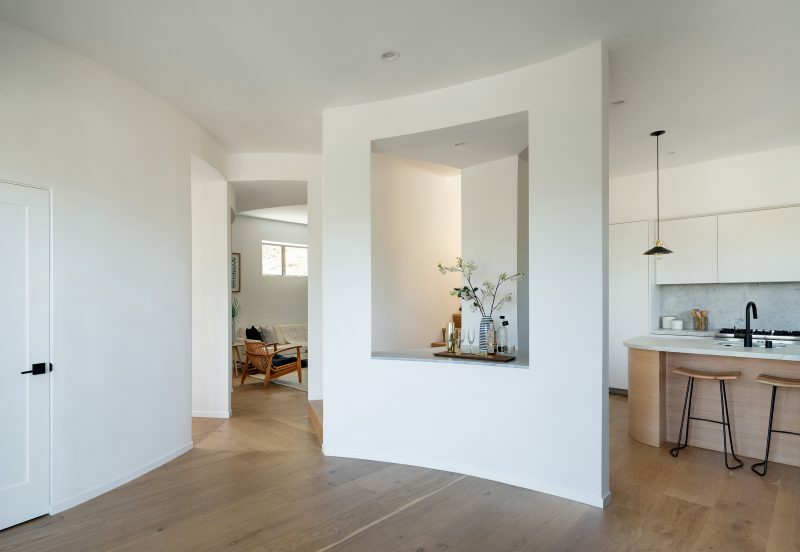 The rotation and offset position of each room creates a loose stack of boxes, reducing the dominant scale of the house and creating an in-the-round rather than purely frontal composition. 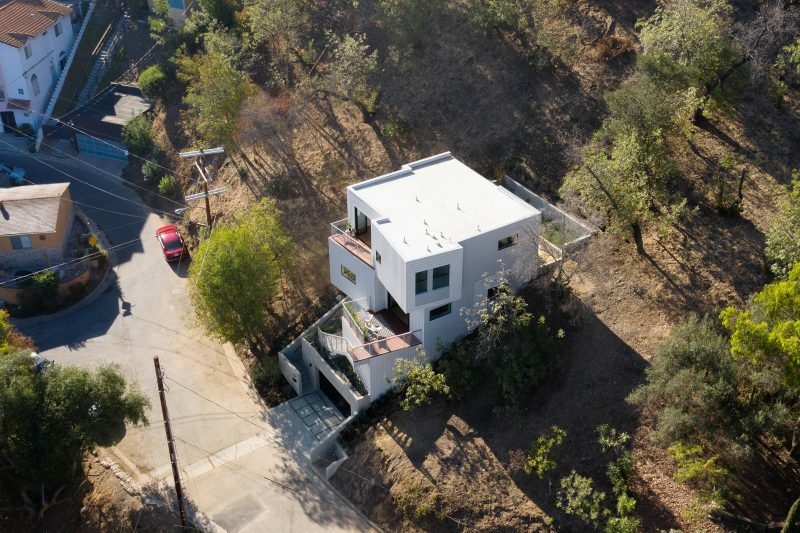 Working with difficult site constraints is central to the design of this house; unlike conventional hillside homes that appear to have been placed atop the slope, this house is embedded into it, creating a much closer relationship to the landscape. With each offset, the adjacent roof becomes a balcony, expanding interior spaces to the exterior at every floor. These indoor-outdoor spaces have varied orientations with unique and unobstructed views to the San Gabriel mountains. The primary living spaces at the third level (dining, kitchen, living, den) are organized into a simple grid of four rooms. 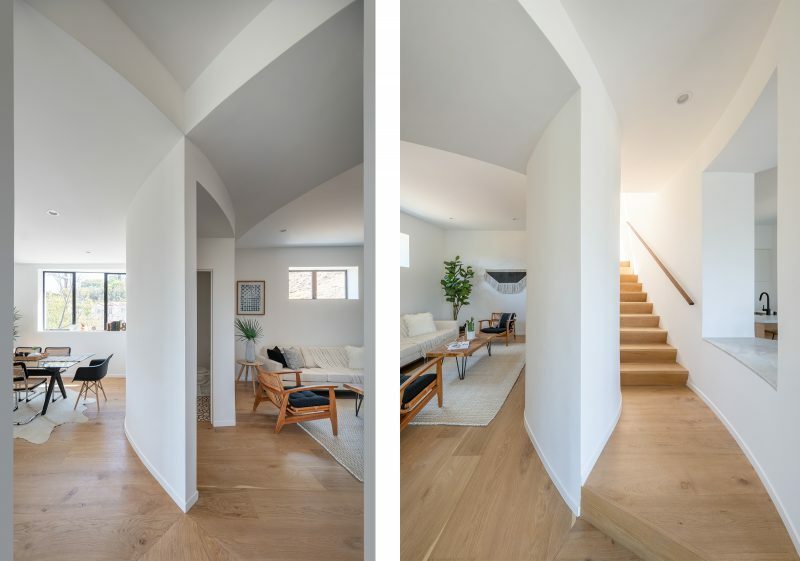 The walls of each room curve at the center in a series of tangent arcs that blend the individual spaces while carefully opening views through the house. A central stair connects the living spaces to a rear dining patio and yard that overlook the house and mountains beyond. The upper fourth level features three bedrooms, with the master and en suite bathroom organized across the front of the house. A private two-car garage or workspace makes up the ground floor. 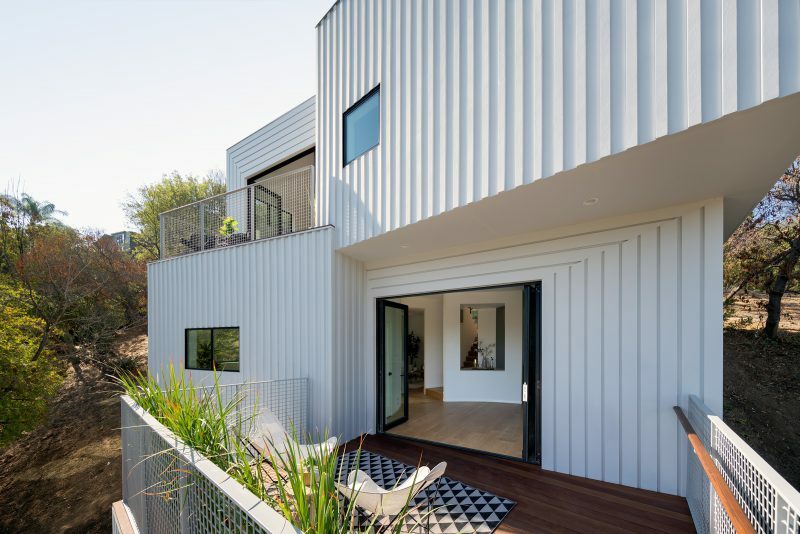 The exterior cladding of the house is custom-made, a play on board-and-batten siding organized into patterns that suggest varied depth and texture. Painted in subtle gradiations from white to gray, the striped shadows of the board-and-battens shift throughout the day. The primary living spaces at the third level (dining, kitchen, living, den) are organized into a simple grid of four rooms. The walls of each room curve at the center in a series of tangent arcs that blend the individual spaces while carefully opening views through the house. A central stair connects the living spaces to a rear dining patio and yard that overlook the house and mountains beyond. The upper fourth level features three bedrooms, with the master and en suite bathroom organized across the front of the house. Interior features include French oak flooring in a natural finish and marble countertops. 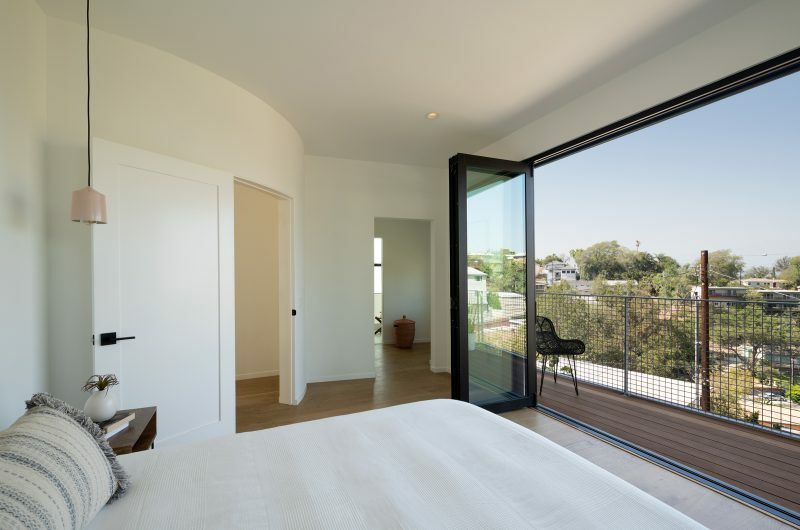 The folding effect of the large accordion doors extend the interior spaces to the outside, allowing for the iconic views unique to Los Angeles hillside living.